Airtel Recharge : Best sources to done it instantly Your existing plan is expired and Do you want to activate another new plan? How to do Airel Recharge? There are two easily methods are available to recharge your airtel SIM or Airtel Prepaid Number. 1. 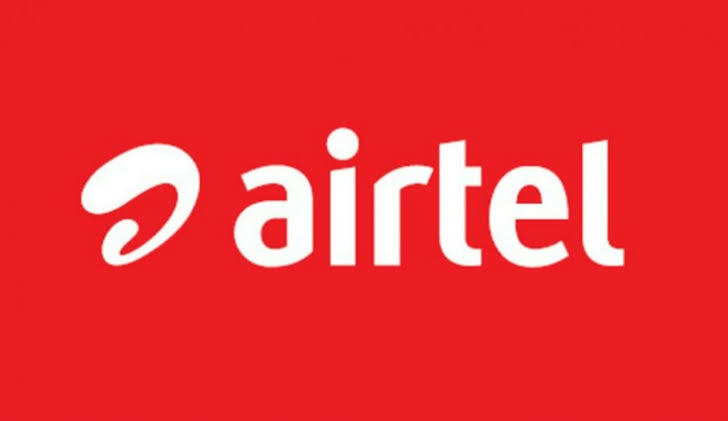 How to do Airtel Recharge Offline? You can visit your nearest airtel customer care, or any mobile shop. You can recharge your number by giving them cash. Customer care or shop worker/owner will recharge your number of any plan that you wants. so visit nearest store. 2. How to Do Airtel Recharge Online? There are many service providers available to recharge any kind of SIM. 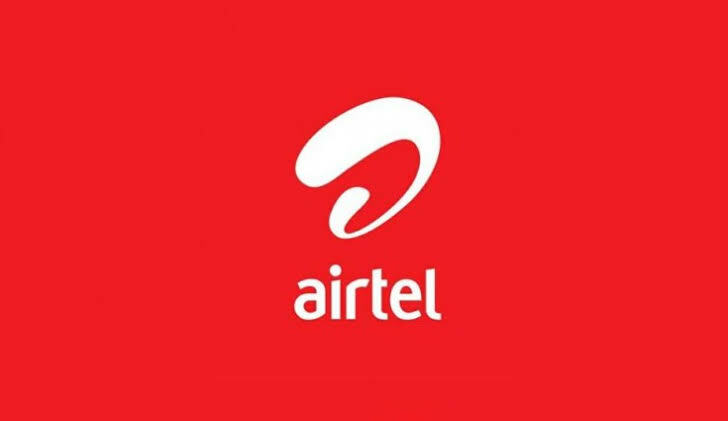 like paytm, phonePe, mobikwik, freecharge, oxygen wallet etc you can also recharge airtel number online by visiting airtel's official website. 2. Put Your 10 digit airtel number in the box given in Webpage. In umder few seconds, a new box will be generated. There you have to enter the amount of your plan which you want to activate. Then click on process button. 3. After Clicking on "RECHARGE" button. You will be redirect to another page where you have to choose the payment gateway and pay the amount to airtel. I recommend you to go with Wallet payment because there you can get few amounts of cashback. But it depends upon you where do you want go with. Afer choosing the payment gateway. Simply pay the Amount. And instantly you will receive messages from airtel that "Your Airtel Recharge is successful"
1. Install Paytm app form Google play Store. 2. Open and Create a new account or Login with existing account. 3. Click on "mobile recharge"
4. After that you will see three box in the first box enter you airtel number which you want to recharge. in the 2nd box select airtel and state. 5. In the third and last box enter the amount. now press the Process to Recharge button. Pay the amount with you credit/debit card or net banking. 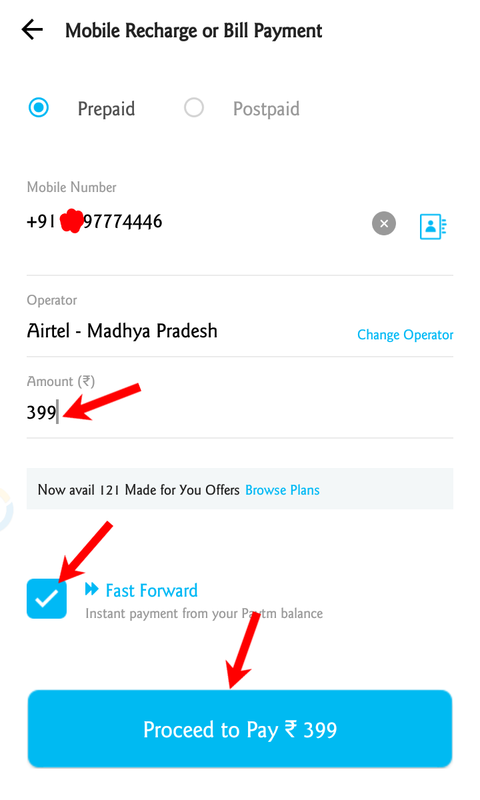 that's it, you have recharged your airtel number online through paytm. 1. To recharge with PhonePe you have to download and install the Latest version of PhonePe by clicking here. 2. Open App and Register with the same mobile number which are linked to you bank account. 3. Now go to Mobile Recharge button and put you details there as..
- Operator as airtel and Circle. - Amount of you plan. gateways to pay the amount. You can choose any gateway but i will recommend you to use UPI. Because UPI transection will give you upto 50% cashback. These are the Top 3 Sources to Recharge Your airtel Number With any recharge plan. These three methods are used by millions of Airtel users. So these are trusted and your bank details will be safe with these companies. Get best Offers by AitelRecharge. 1. 398rs plan : 398rs plan is very popular nowadays because it comes in budget with the Enough data pack and unlimited calling. 2. 399rs plan : 399rs recharge plan is also one the most popular plan because of the validity of plan. you will get plan 84 days where 398rs plan comes for 70days. Here is the benefits of 399rs and 398rs recharge plans. Q1 - How to do Airtel Recharge? A. - Scroll up this page and read the post carefully. So you can get many tips and trick to Recharge your Airtel SIM card. Q2 - How can i Check my Data balance.? A. - After recharge, if you want to sure that your is done or not you have to check it manually. Open your dial paid and Type : *121# and press call button from airtel. You will see a popup window with main balance along with the additional option for data balance. Click on reply and press 2 and send it. You will see a pop up wimdow again with Data balance. Q3 - Airtel Recharge plan 398rs vs 399rs which is best? 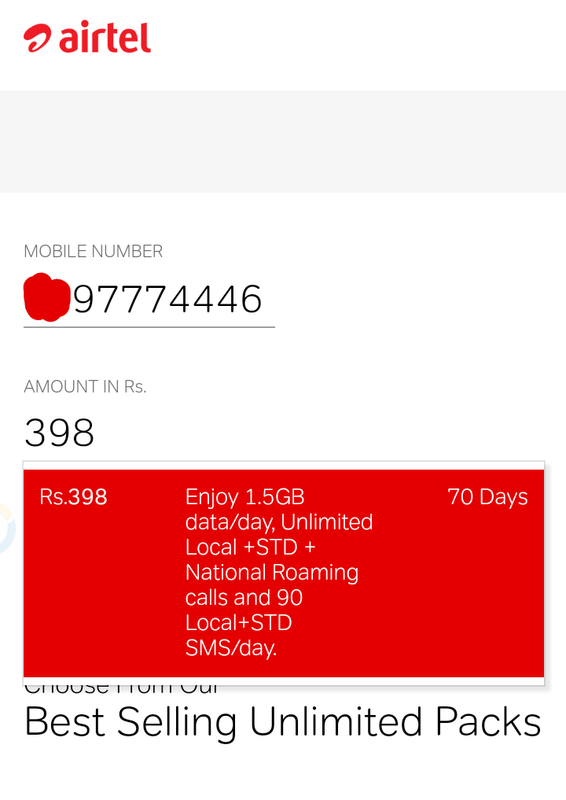 A - You should go with 399rs because in this plan you will receive 10 additional data with the validity of 84day. So this was the information about Airtel Recharge. And if you liked this post share it on social sites. That will help us to grow. Airtel Recharge plan was really awesome.